The City's new Landscape Maintenance team is now hard at work on right-of-way medians! After years of struggling with the increasing cost of contractors, Shoreline formed an in-house team. 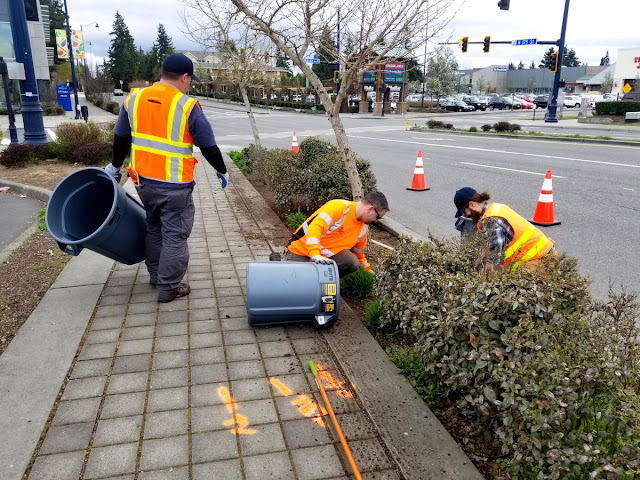 We believe you'll see noticeable improvements in the quality of landscape maintenance in the City. The City workers are not responsible for the planting strips next to private property. It's the responsibility of the adjoining property owner to maintain those - whether a business or a private citizen. Will these people be trained to know the difference between a weed and a desired perennial or other shrub? The city workers that spray and mow our street-side bank seem to hate anything that is green and growing - including the swales that were planted by the city using my tax $. Good for Shoreline! Too much contracting to private companies everywhere! State and local governments, the military, etc. Used to be even if you were a landscaper or auto mechanic you could get a decent, stable, middle-class job with a government entity. Now it's all private companies who couldn't care less about their workers, their quality of service, anything but maximizing profits.